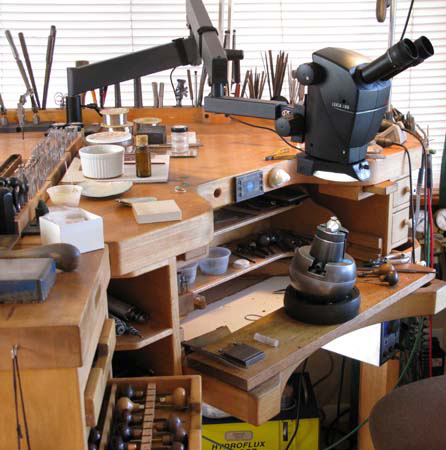 Best Engraving and Stone Setting Microscope! The Leica A60-F Microscope (including Flex Arm Stand and LED Ring Light) delivers superior optics, world class engineering, and full features at an incredibly affordable price. Note: the Optional .5x, .63x, .75x Objective lenses were not originally designed for the A60 series microscope, and as a result, with the lens total focusing range is reduced to approximately 5:1 with the reduction at the high end of the zoom. Even with this reduction, the added working distance and focal area make this an excellent option for this microscope. For a full zoom range, you can add an optional Leica A60 Objective Lens Adapter. Great scope. Very clear and easy to use. The depth of field is very nice. No eye strain after hours of work. Plenty of room for handpieces with the .63 lens. It's very well built, solid mount with no movement. Its always nice to speak with a real person...Tira was very helpful, personable and knowledgeable. I've already recommended this product several times, and will continue to do so. excellent optics, great depth of field , solid build quality and light source .all make this a great investment. I use the microscope in a dental laboratory and it is a pleasure to work with ! I resisted going to a microscope for a very long time, because all of the microscopes I tried did not have the depth of field or the positioning ability I thought I needed. This one does! Clear and in focus right to the edges of the field of view and my line, the graver and the top of my thumb all clear at the same time! I am very impressed and excited to see what else I can do with it! I can't say it enough, but this scope is great! I have had the pleasure of looking through an off-brand scope, a Meiji EMZ-5 (a great scope in of itself, no doubt) and now the Leica A60 I just purchased recently. This is my first scope purchase, and I'm glad for once that I procrastinated because when I first was interested in getting a scope, I don't believe the A60 had come out yet. The depth of field and the clarity are the absolute best. The LED ring light is great too, and I can see every little detail that I couldn't with my optivisor. I am nearsighted and generally have no trouble seeing things up close, but I can tell you that the best eyes in the world wouldn't be able to see what you can through this scope. A good example I can provide is that right after I set up the scope, I took a run-of-the-mill manufactured silver bracelet I had with very small stones (one of the stones was also missing) and put it under the scope. I had put off doing this bracelet because the stones were so small and it was a real pain trying to take care of it with an Optivisor, and I was sick and tired of setting stones that small with it. I could see every detail including a few prongs that had not been set correctly over their respective stones. Using the A60, I immediately set out to correct them, as well as replace the missing stone. This task went from painful to trivially easy from just this one piece of equipiment. I highly recommend this scope! I also have to mention that when I opened the packaging, I could tell that Tira took the time to make sure everything was good and in order. I even got a few mints, which I enjoyed while setting everything up. I will certainly be ordering more from Tira in the future! The A60 was very easy to set up and produced a clearer image than other scopes in this price range. I was worried initially that the support arm would wiggle, but it has been very stable so far. Excellent depth of field indeed and surely enough space with x0.63 lens. Tira et Al made good prework with order so unnecessary stuff is not delivered, Thanks ! I had been in the market for a new microscope and had been checking ebay etc but couldn't find what I wanted plus they were all used with unknown problems. So I decided to buy a new one. Tira sells the Leica A60s and they had been getting some good reviews. I called Tira and she answered all my questions - she is very knowledgable. I ordered an A60F with the flex arm and a .63x objective. When I received the scope, it was packed very well and was in perfect shape. I set it up and the instructions were easy to follow. I really like the brightness and sharpness (in the whole field of view) of the scope and the ring light works very well. The depth of field is really great. It doesn't make much difference on a flat engraving but when I worked on a ring, the sides of the ring were in focus so I didn't have to keep fiddling with the focus while I worked. The .63x objective gave me a little too much working distance and "stretched" me out too much. I ordered the .75x objective and that made me more comfortable with an acceptable working distance. Tira offered to take the .63x objective back but I decided to keep both of them. I can recommend the A60 and the service that Tira provided. So I’ve had an in-expensive scope for a couple of years and I guess I got lucky cause it has been a good scope, and I’ve learned a lot with it. I’ve been reading ALL of the forum ramblings about all the available scopes that artisans used in the engraving craft; why this is good, why this is bad, etc… and I even had a chance to work with another of the recommended scopes at a recent event, and yes I did detect a slight difference in the optics, but not enough to make me run out and spend that kind of cash for a new one, nor have I been lucky enough to find a decent used unit on the World Wide Web. I noticed a friend had put her “Quality Scope” for sale, and I wasn’t quick enough to buy it but I was really curious as to why she would up and sell a piece of equipment that seemed to be the recommended industry standard. Well if you read here recommendation, in this list (Cloudy) you’ll understand why. Tira was a great sales person! She took time out of her busy day, at a recent event to talk with me about the Leica A60, so long story short…I took the plunge and bought the Leica A60 F.
WOW, WOW, WOW! I re-iterate everything that’s been said thus far. From the minute I opened the box to the push of the light switch, the quality of the packaging, as well as the scope, have been very evident. There is a very nice and easy to follow quick-state card that walks you wright thru the initial adjustment and focusing steps and the manual is provided on a DVD. The one thing that jumps out and grabs you is how clear the optics are, across the entire viewing area. I thought my other scope was clear. In my opinion, there is no comparison, not even the more upscale scope I tried out. I can see more of my plate at a greater magnification then I’ve ever been able to do. The eye pieces are on a little different angle which makes viewing for extended periods much more relaxing. I spent about four hours on it the first night, and almost six hours the second night before my wife physically dragged me away from it. I wasn’t sure which of the objective lenses would work for me so I bought all three. My old scope had a .5 which gave me a lot of working distance. I installed the .63x gave me about the same distance. You do loose a little zoom capability with the objective lense installed, but not enough to affect the capabilities needed for Engraving or jewelry work. Max zoom is 30 without the objective lense and 25 with it installed. There is more than enough working distance to stand any of the power engravers on end for stippling. I would more than likely put the .75 or .5 objective lense on if I were to go old school with a hammer and chisel. The LED ring light is BRIGHT but it has a really nice diffuser and can be adjusted way down. It has a very light blue tint to it. The controls are right in front and very user friendly. It is a very solid unit! I have a really heavy microscope base that actually holds my work bench together, and I like the articulating microscope arm on it. Much to my surprise, the pivot arm on the Leica A60 fit nice and snug into it. Since the adjustable arm that comes with the Leica A60 F has a 48” reach, I attached it to my main shop work table and installed my old scope to it for other uses. Spending the extra money for the Leica A60 over an off brand was a good decision. The clarity of this unit is superb and it is very well built. Click the button below to add the Leica A60-F Engraving and Stone Setting Microscope with Flex Arm Stand and Ring Light to your wish list.